Yallourn, an industrial town and a garden suburb, ceased to exist 50 years after its beginnings in 1924. It was in the Latrobe Valley, 125 km south-east of Melbourne. The name was thought to derive from Aboriginal words meaning brown fire, a fitting tribute to the proposed brown coal electricity generation works expounded in a report of the State Electricity Commission on the Yallourn project in 1921. The town plan for Yallourn was prepared by the Commission's architect Alfred LaGerche (1873-1948). LaGerche also designed many of the town's civic buildings, mostly in a moderne style as can be seen in the Commissions former building at 240 Flinders Street, Melbourne. The absence of motor car transport dictated that the town should be within walking distance of the brown coal mine, power station and briquette works. The first sod for the power station was turned in February 1921 and the briquette factory was under construction by 1923. On 24 June 1924 power generated from brown coal began to flow into the transmission line to Melbourne. In Yallourn town there were 200 houses and buildings, and a primary school for 350 pupils was in the course of construction. LaGerche's crowning architectural achievements came with the hospital (1929), the technical school (1936) and the civic theatre (1939). Houses were built on generous allotments, although with differing grades of design and finish, dependant on employment rank. 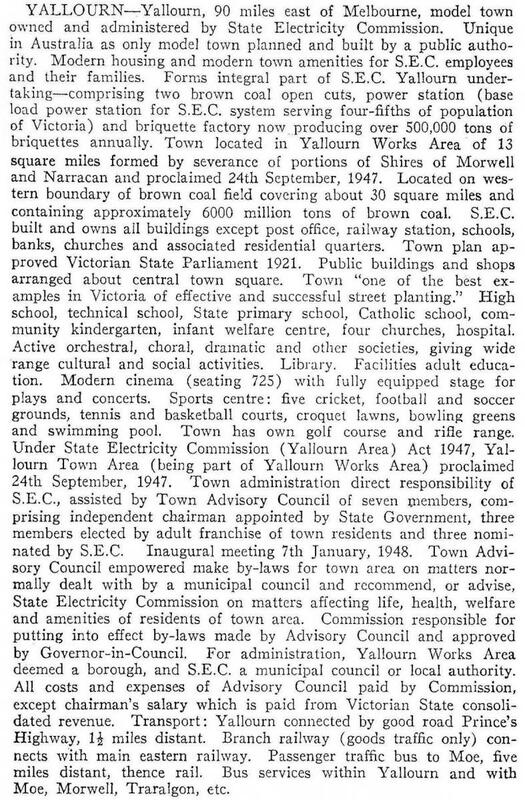 While the Commission was designing the school and the theatre it had discovered that the town was built over the brown coal seam that gave Yallourn its purpose. Building of houses and facilties, planting of deciduous trees and even the manufacture of distinctive bricks and tiles went ahead, and Yallourn's population doubled from the 1930s to the 1950s. There wre a couple of annoyances. Coal dust descended on house tops and clothes on lines, and Yallourn was paternalistically run by the Commission. Commission staff kept an eye on people's front gardens and general tidiness, and intervened where they thought standards were below par. Officialdom was modified by a part elected, part nominated town advisory commitee (1948). Coinciding with the commitee, the Commission published a coffee table book, Three decades, which included a chapter 'The spirit of Yallourn'. Not only was there pride in community spirit, but town planning leaders had commented favourably on Yallourn. There were five banks, Purvis and Rockmans chain stores, a trades hall, council and a Serbian Orthodox church. More improvements came to the well appointed township. An Olympic swimming pool was completed in 1959 and an extra lawn was added to the croquet club in 1960. In October 1961 the Commission announced that the coal under Yallourn should be taken from about 1995 onwards and ultimate abandonment of the town should be considered. The warning was affirmed in 1969. Movements to save Yallourn, despite its special model-town on garden-suburb qualities were overruled. In 1975 house removals began, many houses being re-constructed in Newborough. Some public artworks were saved, such as the bust of Sir John Monash, the Commission's first chair, which went to the Morwell art centre and Arthur Boyd's church mural which went to Morwell's Anglican church. By 1976 Yallourn had fewer than 2000 residents. A back to Yallourn celebration in March 1976 was a last hurrah, and in 1984 the occupant of Yallourn's last house, an assistant chief engineer, moved out to a new place in Yallourn Heights, Newborough West. The golf club and the bowls club both relocated to Newborough. Yallourn W power station (1982) stands in place of the town.